Family firms are ubiquitous and play a crucial role across all world economies, but how they differ in the disclosure of social and environmental actions from non-family firms has been largely overlooked in the literature. Advancing the discourse on corporate social responsibility reporting, we examine how family influence on a business organization affects CSR reporting. The arguments developed here draw on institutional theory, using a rich body of empirical evidence gathered through a content analysis of the CSR reports of 98 large- and medium-sized Italian firms. The grounded theory analysis informs and contextualizes several differences in the type and content of corporate social responsibility reports of family and non-family firms. Our findings show that in comparison to non-family firms, family firms disseminate a greater variety of CSR reports, are less compliant with CSR standards and place emphasis on different CSR topics. We, thus, contribute to the family business and corporate social responsibility reporting literatures in several ways, offering implications for practice and outlining promising avenues for future research. Giovanna Campopiano and Alfredo De Massis have contributed equally to this work. Block, J., & Wagner, M. (2010). Corporate social responsibility of large family and founder firms. erasmus research institute of management, report series research in management. Available at SSRN: http://ssrn.com/abstract=1625674 or http://dx.doi.org/10.2139/ssrn.1625674. De Massis, A., Kotlar, J., Campopiano, G., & Cassia, L. (2013d). The impact of family involvement on SMEs’ performance: Theory and evidence. Journal of Small Business Management. doi: 10.1111/jsbm.12093. Ding, S. & Wu, Z. (2013). Family ownership and corporate misconduct in US small firms. 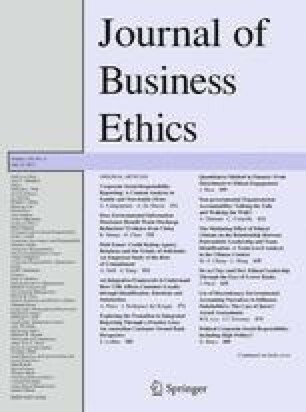 Journal of Business Ethics, in press. doi: 10.1007/s10551-013-1812-1. European Commission (2008). Overview of family business relevant issues—Country fiche Italy. Available at: http://ec.europa.eu/enterprise/policies/sme/files/craft/family_business/doc/familybusines_country_fiche_italy_en.pdf. Accessed 20 Nov 2013. Young, S., & Marais, M. (2011). CSR reporting: An Institutional perspective. Finance and Corporate Governance Conference, La Trobe University. Available at SSRN: http://ssrn.com/abstract=1776193.